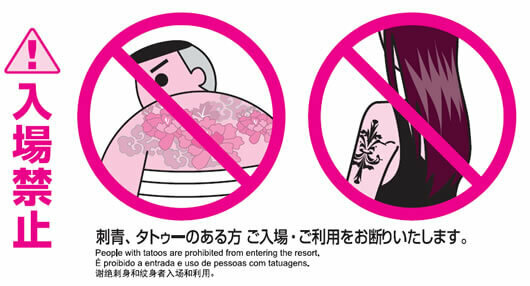 In Japan, it is common to see signs saying “No Tattoos” at onsens, beaches, public pools, and gyms. Tattoos are a very touchy subject in Japan, with new generations being accepting of the body art, while older generations still maintain their views on tattoos. In Japan, it is commonplace for tattoos to be associated with “Yakuza” (the Japanese mafia), and “Yakuza” is associated with crime. Therefore, Japan has a highly stigmatized view towards tattoos. It is not uncommon in Japan to be kicked out or refused service because of tattoos. While this is the case, some hot springs and other tourist spots are becoming more accepting, providing stickers to cover your tattoos at onsens rather than kicking out patrons. Some larger cities, such as Tokyo, have become much more accepting regarding tattoos as well. Legendary Japanese tattoo artist, Horiyoshi III, views tattoos as the carving is one’s personal symbol, illustrating that a person who decides to have a work of art on their skin does not make them a gangster. Horiyoshi views that the tattoo isn’t what makes a person good or bad, rather their actions. Many of the younger generation has embraced these ideals; Horiyoshi reports that in recent years, 90% of his clientele are non-Yakuza. Although there are issues with tattoos in Osaka, the newer generations are more likely to accept the body art. While there are changes in public perception and more acceptance, it is always a good idea to check with the onsens on their policies regarding tattoos ahead of time. Some onsens offer private rooms which may be a good idea if you have a larger tattoo. If you have a smaller tattoo, it will be a lot easier to cover up while in Japan, leading to a relatively worry-free time. We recommend if you do have a tattoo, please try to keep it covered up as best as you can.